Both of these novels are works of a great imagination, illustrated with bizarre images from old photos that the author and people he knows have collected. The author uses the no-doubt manipulated images, reproduced throughout both books, in an enormously effective way. 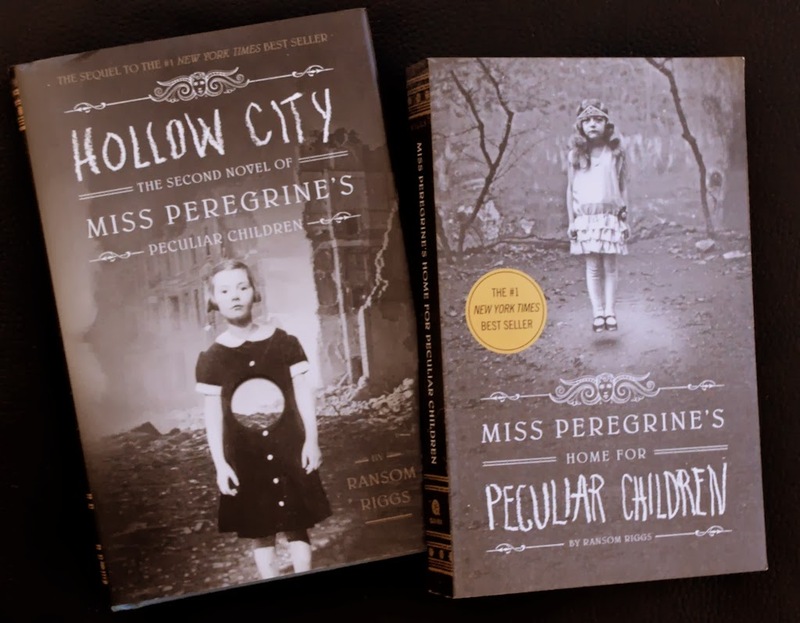 Peculiar children, the books show, each have a special capability, such as Olive, the child taken from the photo on the front of the first book, who levitates uncontrollably, just floating upward unless she wears extra-heavy shoes or is held by a tether. She's often controlled by Bronwyn, whose talent is extraordinary strength. On their adventures in both books, the girls are accompanied by a girl who can make fire with her hands; a boy who keeps bees in his stomach and expels them when needed; a boy who is totally invisible unless he is wearing clothes; a pair of inseparable blind twins who echolocate like bats, and a number of others. They learn to turn their abilities into more than a curiosity as the books go forward. Both volumes are narrated by Jacob Portman who started in the first volume as an ordinary boy growing up in Florida, but learned of his peculiar talent when his grandfather suddenly died. Jacob has always known his grandfather was unusual, but grandfather's death at the hands of a horrendous monster shows Jacob his own talent: he can sense the presence of such monsters. And suddenly the horror stories he thought his grandfather had made up, and the peculiar photos his grandfather had shown him when he was young and, as he later thought, gullible, have a whole new meaning. After his grandfather's death, Jacob follows some hints his injured grandfather gave and meets Miss Peregrine, a shape-changing bird-woman, and the peculiar children under her care. Jacob and the peculiar children engage in a kind of time-travel, mainly from the present twenty-first century in Florida and on a mysterious island in Wales to the early days of World War II when the Nazis were bombing England. Most of the second volume is an story of dread as they flee both the Nazi bombs and the monsters that prey on peculiar children and their bird-women caregivers. Throughout both volumes, Jacob and his friends learn more and more about the long history of "peculiars," for instance interestingly meeting a Gypsy band who have always been somehow allied with the peculiars as they are both persecuted for their differences. And sometimes the supernatural monsters disguise themselves as Nazis or policemen or other authority figures. Ransom Riggs to my knowledge hasn't announced how many sequels about Miss Peregrine, Jacob, and the peculiar children he plans to write. Each of these two books ends in a kind of cliff-hanger -- almost literally in the first one. Miriam and I have been waiting since last spring for Hollow City to be published, which just happened last week. I hope Riggs can keep writing suspenseful, attention-grabbing sequels as long as he wants to -- though based on other series books, that seems a lot to hope for. Dates I read these books: last spring and January 19. These sound fascinating. I'm always entranced by books that use visuals in different ways and World War II in Europe is another area of interest. I may check these out. They sound so very compelling.